I have long been warned by Eric Meyer of the danger of front wheel speed sensors failing on RX-8s in race conditions. I have heeded his warnings, and therefore started this season and last season with brand-new hubs. It didn't save me this year. I want to share this failure with the group in an attempt to learn and, hopefully, find solutions - or at least mitigate the risk some. I'll tell you what this failure feels like. We had our last NASA GL event of the season at NCM over the weekend. I was running in HPDE 3 for a monster passing drill, which was a lot of fun. Our HPDE 3 drivers are highly advanced and capable of passing off-line, mid-corner safely. After the drill, the track went green. When braking into turn 3, I thought I just blew it. Ambient temperature was a little low, and coincidentally I had Eric Meyer riding in the passenger seat with me. I went past turn 3's apex with understeer I found a bit surprising. I was on the oldest tires I had with me, and had a passenger - weight I wasn't used to. So I just figured it was my fault. Turn 5 is a high-speed right-hand sweeper. I brake from about 110mph to about 90-95mph. I applied my typical medium pressure there...and the car just went straight off the track, with the front left wheel locked. With modulation of the brakes and gentle inputs, I was able to get the car under control on the generous paved run-off provided. At that point, Eric told me to crawl through the rest of the lap. The wheel speed sensor failure he had warned me of for years had clearly reared its head, according to him. I avoided the brakes and headed in at a very reduced speed. My front-left tire had a pronounced flat spot. I would like to see if my OBDII reader can see individual wheel speed sensors. If so, I'll try to see what that failure looks like (besides OHGODI'MGONNADIE). I have a couple ideas. One is to install an ABS kill switch I can hit in an emergency. It won't save me from the first surprise, but could allow me to continue to use the brakes after that. Another is to write a script for my datalogger/dash to warn me when it sees a front wheel speed sensor differ hugely from GPS speed. I don't know why these sensors fail. Maybe it's heat. Maybe it's lateral load from slicks. I can try to disassemble the one that failed, but that's unlikely to help us. I wonder whether there are better options for hubs, though. I wonder whether the S2 (which appears to have a different sensor - at the very least a different plug) is a better part. Or maybe another brand, like Timken? Please share your thoughts, and stay safe. Replace those hubs often. Time to dissect the hub to see if you can find the failure mode. I wonder if the individual wheel speeds are reported across the CAN or if the ABS module takes them all in and then outputs an aggregated signal. I suppose one way to tell would be if the individual wheel speed sensors connect directly back to the ECU or if they go to a separate module first. Last edited by NotAPreppie; 10-31-2018 at 01:03 PM. First I need something that can display live wheel speed sensor data. I don't think my OBDII reader can - I don't believe anything related to ABS is in the list of PIDs. You're assuming that live wheel speed sensor data is broadcast on the CAN. It may be reported directly to another module which does some processing first. The individual speed sensors are definitely broadcast over CAN. 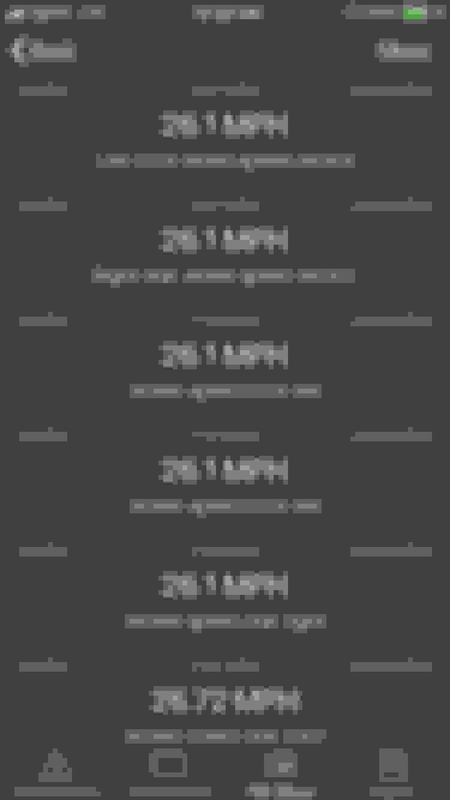 I get all four readouts on my AiM dash. With something like the AiM, you can also program outputs based on whatever threshold you like (which can be associated with a custom math channel, if that made sense for ID'ing a failure condition). That would allow you to automatically trip an ABS kill switch if that was the intent of the manual one. Or you could simply have one of the dash lights go off if it registered a threshold condition, then you would know not to get hard on the brakes and just bring the car in safely. All this depends on knowing what sort of "condition" could be flagged as a failing wheel speed sensor. Individual wheel speeds are always varying a bit from GPS speed (almost always varying a little bit from one another too), but how much is "out of spec/norm" I couldn't say. We probably need to hunt down an engineer who has worked on ABS systems before. It looks to me like a failure typically presents as zero wheel speed - at least in other cars. That sounds odd. A wheel that locks up is at zero wheel speed and it goes there very rapidly. The ABS system is already going to task as soon as it sees a rapid deceleration beyond some predefined amount (that's why, in the case of the S197 Mustang, the motorsports ABS module is preferred when using slicks - it's not programed to see huge amounts of deceleration as a pending sign of wheel lock up, so it's threshold allows it before engaging). So seeing a zero wheel speed seems to be the very condition that it would be programed for to go into its engage/disengage cycle. You wouldn't expect it to go into a full-lock/full-brake mode at a zero wheel-speed sensor reading. Keep in mind, I know next to nothing about these things, so take it with a grain of salt. DO NOT USE TIMKEN OR MOOG HUBS. I have tried them, and they fail and develop slop and play in the bearing WITHIN A SINGLE TRACK SESSION. I developed huge pad knock back after just a few laps.. pulled in, jacked up the car, TONS of play in the wheel. They are beyond garbage. i couldn't believe i was failing these after less than 20 minutes on honestly not very good tires. Switched to OEM hubs and BAM, good all season. Still tight as a drum. thanks for the info Matt, i'll order a set of oem and keep in the tool box as spare. I thought his hubs this year were OEM hubs. Rumors. So we'll wait to hear what he confirms. Oh, I also think we should be clear on what we're referring to here. The bearings may get loose (ala Matt's experience), but this is different from the speed sensors failing - which they seem capable of doing even if the bearings are tight. I know we can test for tightness to ensure they're within spec, but we could use a way to test the sensor itself (maybe some sort of Ohm test?). 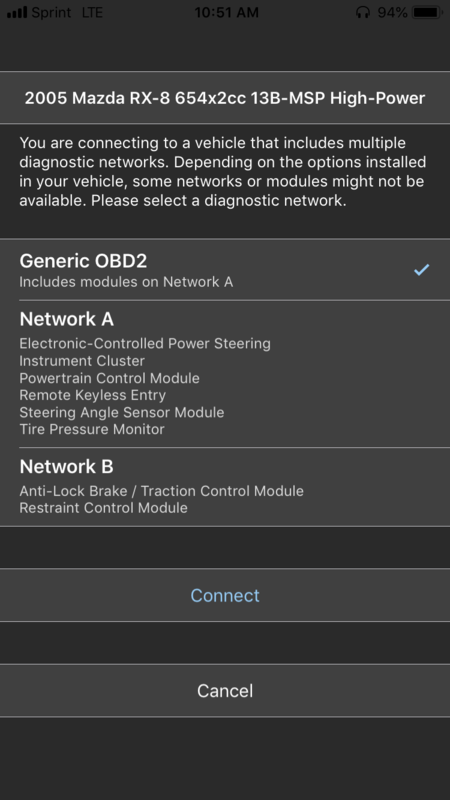 according to Eric Meyer, you can test the sensors if you have obd2 scanner that read wheel speed. he said they should read a certain value when the car is not moving when the sensors are functioning correctly. Okay, had a chance to run down a couple of points here. Spoke with Eric Meyer today about this issue. First, at idle the wheel speed sensor should read zero - and I've confirmed that to be the case on mine (known good sensors). Second, a bad sensor will read an unusually high speed, regardless of actual wheel speed (by "unusual" I mean around 200 mph, even at idle). Third, the failure mode described to me is not what we suspected: it is not the engagement of the anti-lock system; it's the failure to do so under genuine wheel lock-up. This is how Eric explained it: the bad wheel sensor is sending the ECU the message that the wheel in question is zipping along just fine. Under actual wheel lock-up, the anti-lock system doesn't engage that wheel since it sees nothing wrong with it, so it locks up when it should've been dealt with by the system. Now that I think about it, I'm a little confused and will need to ask Eric more about the failure mode. If the anti-lock simply failed to engage, you would get sub-optimal braking. I don't see this alone making the car downright dangerously unstable. Seems you would need one side to engage and the other to go into failure mode to create such instability. I'm not sure that's the case. An alternative might be that the car's stability control system senses the dramatic difference in wheel speed and actively seeks to compensate for it. That could lead to pretty severe instability if the car was in fact decelerating along normally at the time. The other thing that doesn't make sense is that Nick experienced severe instability even while modestly braking. That would eliminate the idea that the car is otherwise going into lock-up mode and the bad wheel sensor doesn't ID it. Something more seems to be going on. I'd like to see Nick's data to see if he's showing that unusually high (near-200 mph) reading, and even while sitting still. The first couple track days I had no ABS. DTC60 front and HT10 rears (engine swap so I’m front heavy) per Jay Andrews recommendation. Even then the fronts locked in an uncontrollable manner with anything over moderate braking. Destroyed tires and have never gone slower at Blackhawk which has a bunch of heavy brake zones. When the front tire(s) lock it feels like you aren’t slowing at any kind of reasonable pace - very unsettling especially when you aren’t expecting it. I bet that’s what you experienced Nick - just an RX8 without ABS. I remember your car used a bunch of ABS back when I was right seating with you. PS: I got the ABS functional and now the brakes are magic. Wow, okay then. Not what I'd expect, but in-line with what Meyer was saying and sounding very similar to what Nick experienced. Now I need to get my head wrapped around why this would be the case...I mean it almost sounds like in some way or other the car is "always" using the ABS system. Sort of like ABS is central to how basic brake bias is set. I just drive the damn thing; I have no idea how its systems are designed. I know a guy though (funny clothes, pointy hat, goes by the name of "Merlin"), seems to understand how the engine works. I'd bet that the ABS system also functions as the proportioning valve for brake force distribution front/rear. If ABS wigs out, you get wacky amounts of front bias. Correct. Electronic Bias Control, or brake force distribution, or something similar. Undrivable without ABS for this reason. I have only used OEM hubs. I already passed this on to Mr. Pockets but figured I’d throw it up here. There are three separate PIDs for wheel speed. I found this using OBD Fusion ($10) after buying access to the extended functionality for 2005 Mazda RX-8’s (another $10). 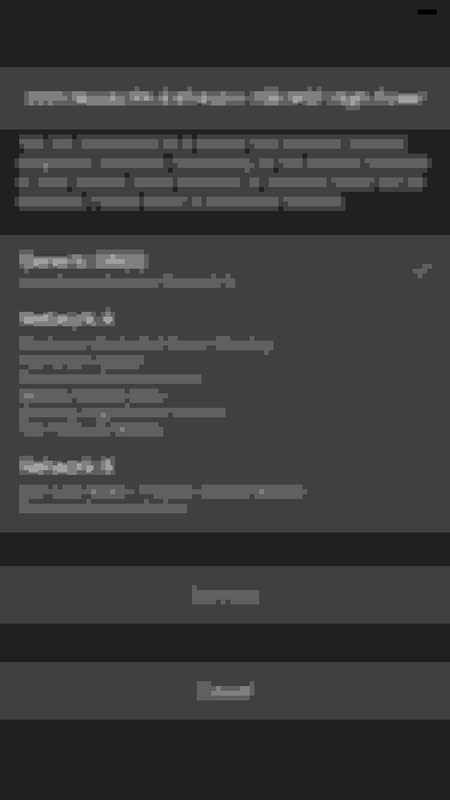 After purchasing the add-on, the app will prompt you for which network to connect to (normally it just connects to generic OBS2 without prompting). After that, it will scan for valid PIDs and then off you go. As you can probably guess, the wheel speeds are accessed via Network B.
Annoyingly, the app doesn’t display actual information on the addresses of the PIDs so if you want to monitor them without paying for the app and in-app purchase you’re going to have to start packet sniffing the CAN-BUS. Last edited by NotAPreppie; 12-02-2018 at 09:06 PM. Killing the ABS will result in the same problem. As I posted before on the forum, rear brake proportioning is entirely controlled electronically through the ABS system. Killing it means very little to no rear braking as somebody else reported and that’s why. Still going to have a OHGODI'MGONNADIE moment regardless. Only way around it is to reroute the lines around the ABS controller and install a mechanical proportion controller on the rear brake lines for a conventional non-ABS system. Last edited by TeamRX8; 12-23-2018 at 07:41 PM. They're available on the CAN bus if you have a CAN enabled logger (Racecapture or something similar). All 4 wheel speeds are on the 500k bus at 0x4B0. LF, RF, LR, and RR are on bytes 0,1; 2,3; 4,5; and 6,7. Subtract 10000 and divide by 100 and you get wheel speed in km/h. My project is still stationary, but I'm able to read all 4 wheel speeds on a Racecapture logger in my garage just by spinning the wheels by hand. It would be possible to set up a warning message to detect a sensor failure. Since my first post I have learned what you just said - that brake proportioning is controlled by the ABS. What i wonder now is whether S2 hubs are any better. Mazda imroved a number of things in the S2. Are the hubs one of those things, I wonder? They are slightly different and use a different plug. I’d have to make an adapter to try them. Are they even compatible with the S1, I wonder? I hope you’re doing well, man. I’m not sure. Didn’t really think about it when I put a new set of front hubs on at the end of 2017 before going awol on finishing the car out. Already had one new S1 hub that a Miata guy sold to me cheap and then just ordered another one to match it. Which I was still on the original hubs since the car still has less than 30k miles on it, lol. TBH they still seemed fine, but since they’ve seen a lot of non-standard use and I had the one sitting around it just seemed prudent to just get it done while I had it tore apart for the NC3 camber bushing install. I finally had a chance to talk to Mazdaspeed today. I wanted to know whether the S2 hubs were compatible. If so, were the wheel speed sensors improved? And Mazdaspeed says they were not improved anyway. They said they were just made common with the MX-5, since those racers were switching to the RX-8 hubs anyway. 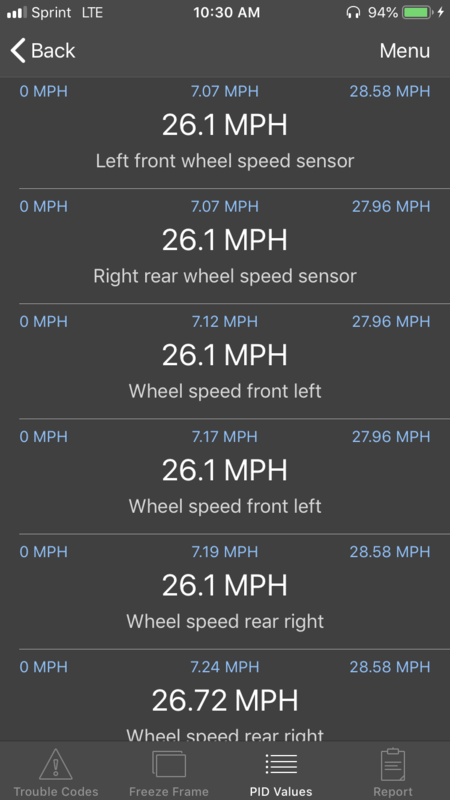 I do finally have an app and adapter that will read wheel speed sensor output. I'll plug it into the car and see what a failed one looks like. Okay, I tried out OBD2 Fusion on my car. After some dumbing with the settings, I found the wheel speed sensor PIDs. I don't see any difference between the front left and front right sensor readings, in the garage. Just sitting there on stands, they both read zero consistently. If I spin them, they show that. I have no idea. Is it just an intermittent failure that I'm unlikely to catch in the garage?